THEY might be ancient graffiti tags left by a worker or symbols of religious significance. A robot has sent back the first images of markings on the wall of a tiny chamber in the Great Pyramid of Giza in Egypt that have not been seen for 4500 years. It has also helped settle the controversy about the only metal known to exist in the pyramid, and shows a “door” that could lead to another hidden chamber. 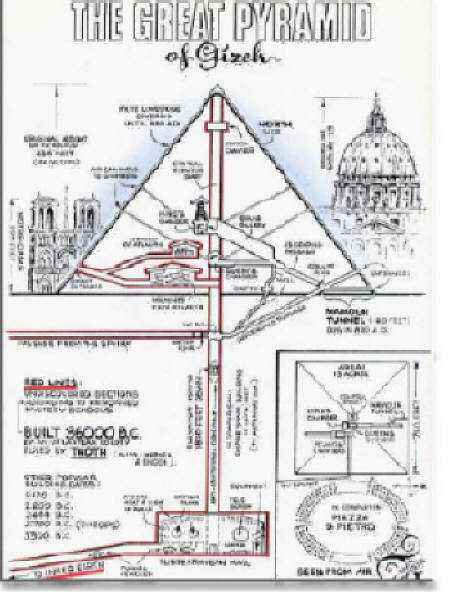 Compare The New Scientist Diagram of the known pyramid interior (link in article above) with the one provide me by my friend and Hollow Earth Artist Max Fyfield over 20 years ago. The etching of a starmap centered exactly above Gantenbrink’s Door, in the “airshaft’ running up and away south from the Queen’s Chamber in the great pyramid, depicts some amazing surprises for us all, if we would only do the research. No hieroglyphs here at all; just celestial markings. These markings were NOT purposeless graffiti; because if purposeless graffiti were allowed, then markings would have been found all over the pyramid, and they were not. 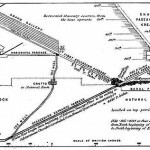 All facets of the pyramid were aligned to a Northmark – INCLUDING the shaft pointing south – to align that shaft to something different than the true north sky (what everything else was aligned to) would have caused failure in the engineering. Is there one above the north shaft door? I do not know, because we were in such a rush to drill holes in things, that we failed to follow the scientific method and document the walls, pollen, markings, techniques and patina untouched, first. Egypt’s Supreme Council of Antiquities stopped granting permits for research such as the Djedi robotic exploration of the Great Pyramid. But it has recently started granting permits again. Featured Image: Pyramids of Gizeh. 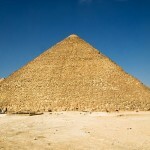 The Great Pyramid. 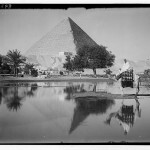 Reflecting pyramid mounted camelman. SOURCE: Library of Congress. (Public Domain). Civilization Found Melting Out of Ice in Antarctica? Video about how Antarctica was up way more north. Look at the maps.